Situated in Murcia, Hotel Arco De San Juan has free bikes and a shared lounge. This property is located a short distance from attractions such as Roman Bridge, Episcopal Palace, and Murcia Cathedral. Murcia Bull Arena is 400 metres from the property. At the hotel, the rooms have a desk and a TV. With a private bathroom equipped with a bath and free toiletries, rooms at Hotel Arco De San Juan also offer free WiFi. The rooms at the accommodation include air conditioning and a wardrobe. 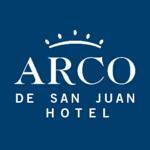 Hotel Arco De San Juan offers a continental or buffet breakfast. At the hotel you will find a restaurant serving Mediterranean cuisine. Speaking English, Spanish and French at the 24-hour front desk, staff are willing to help at any time of the day. Bellas Artes Museum is a 6-minute walk from Hotel Arco De San Juan, while La Merced University is 500 metres away. Murcia-San Javier Airport is 36 km from the property.